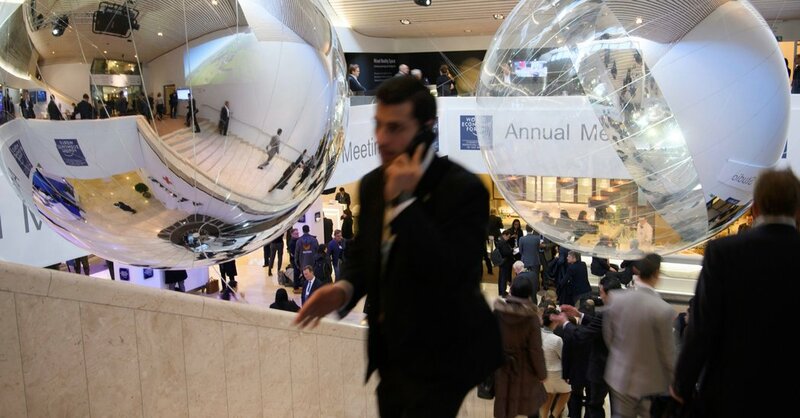 LONDON — The World Economic Forum has never suffered from a lack of extravagance. But this year the champagne may be flowing even more freely than usual in the Swiss Alps resort of Davos, owing to a turn in the global situation pleasing to the sorts of people who make the annual pilgrimage — heads of state, corporate chieftains and those who manage extraordinary piles of money. The last time these putative guardians of civilization convened for this festival of internationalist concern, they found themselves in an uncustomary position: in the cross hairs of a global insurrection. Britain had recently voted to abandon the European Union, dealing a shock to post-World War II European integration. An outsize share of the French electorate was in the thrall of Marine Le Pen and her threats to advance the revolt against European leadership. Donald J. Trump was only days away from his inauguration pledging to use the Oval Office as a war room in a relentless assault on global institutions, including the World Trade Organization, NATO and the Paris climate accord. From inside the World Economic Forum, which starts on Tuesday, these events seemed part of the same storm system, one energized by anger in many major economies over widening income gaps. Those wealthy enough to own jets — a group amply represented at Davos — were pulling away from everyone else. The resulting popular fury was threatening to tear down decades-old international agreements. The threat to the rules-based international order appeared so dire that when President Xi Jinping of China devoted his address before a packed assembly to fashioning himself a champion of global trade, he was celebrated as a rare source of adult supervision in an era of reckless iconoclasm. Never mind that Mr. Xi’s government jails dissidents, censors the internet and is accused of running a relentlessly mercantilist economy. Among the investor class at Davos, he was the newly enshrined leader of the world. A year later, anxieties over populism have largely subsided, and the global economy appears healthier than anytime in years. American participants will arrive only weeks after Washington showered wealthy households and corporations with generous tax cuts. And the man who bestowed that windfall, President Trump, now plans to attend Davos, as if to underscore fraternity with his billionaire brethren. The Davos crowd had plenty of reasons to feel fortunate before. Now, they have more. Ms. Le Pen was vanquished by an unabashed champion of globalization, the former Rothschild investment banker — and previous Davos attendee — Emmanuel Macron. Britain is still officially pursuing an exit from Europe, but one that involves changing little of substance while the politicians pretend to serve up a revolution. And Mr. Trump’s antiglobalist thunder has produced minimal alteration to the global order, with NATO and the W.T.O. still alive, and a promised trade war with China yet to materialize. For the first time since the global economic downturn that began a decade ago, the world’s major economies are growing in unison. Europe, long the basket case of the world economy, is now a leader in expansion. In France, Mr. Macron’s victory has delivered alterations to the country’s famously voluminous and inflexible labor code, pleasing business overseers while promising Nordic-style protections for workers. Spain, long synonymous with youth unemployment, has shown vigor as exports grow. Not even the drama over the threat of secession from the wealthy region of Catalonia has derailed growth. In the United States, an increasingly robust economy fed by stimulus unleashed in the Obama administration has gained momentum from a raging stock market fueled by investors delighted in the corporate tax-cutting, regulation-slashing proclivities of the Trump administration. China has quieted fears that its years of breakneck economic growth would yield a destabilizing slowdown, instead adding to the global growth festivities. Brazil has escaped its depression, and Mexico continues to grow in the face of doubts about the North American Free Trade Agreement’s survival. Even Japan, where recessions are rarely distant, has impressed with an enduring economic expansion. For Davos participants, who tend to enjoy a self-congratulatory worry about sub-Saharan Africa in between mindfulness training, a simulation of life as a Syrian refugee and an economic rationale for low taxes, these are comforting times to be alive. Not that the worry cabinet is empty. As Mr. Trump and the North Korean dictator Kim Jong-un continue to exchange insults and threats of nuclear Armageddon, no moment is fully insulated against dread. The China trade war Mr. Trump has long promised could become reality as he grows frustrated with Beijing’s reluctance to deny North Korea access to fuel. Washington’s continued renegotiation of Nafta could yield an impasse at seemingly any point, imperiling commerce among the United States, Canada and Mexico, and perhaps serving a shock to the global supply chain. Though Europe appears far stronger than it did a year ago, a looming election in Italy could elevate the Five Star movement, a party that has been skeptical of the euro and the European Union. A fragile leadership coalition in Germany, Europe’s most powerful nation, has diminished the prospect of further European integration, rendering unlikely aspirations pursued by Mr. Macron for the creation of a finance minister for the 19 countries that use the euro along with a shared budget. Britain’s mode of exiting Europe is clearly aimed at protecting the status quo, yet acrimony within the governing Conservative party combined with perpetual misreading of the European political mood could derail all that. The year underway is supposed to see Britain and Europe negotiate the framework of their new trading arrangement, a fraught and complex undertaking in the best of circumstances. A rupture would cost treasure, given that nearly half of Britain’s exports land in Europe. Not least, the same sources of anger that built the populist wave are still operative, even if the political tenor has — at least for the moment — moderated. While the global economic expansion has generated jobs in many major economies, wage gains remain weak. In Britain, typical workers are earning less than they did a decade ago, after accounting for the rising costs of housing, food and education. In the United States, most workers have not had their pay climb in inflation-adjusted terms in more than four decades. Mr. Trump’s lone major legislative achievement, the passage of a $1.5 trillion package of tax cuts, is likely to exacerbate that by concentrating most of the spoils to wealthy households and corporations. The Republican Party appears likely to trim spending on publicly financed health care for poor and older people as a way to cover the revenue lost from cutting corporate taxes. At last year’s World Economic Forum, the official agenda was full of conversations about how to reform capitalism to make it more bountiful for broader portions of the public. It was not a new conversation for Davos attendees, but it had gained urgency with the sense that the pitchforks were then massed at the palace gates. The solutions discussed were short of items involving money changing hands. Some participants talked about the middle-class-restorative effects of sleep and meditation, as if the compulsion of wage earners to work second jobs reflected their failure to settle on the right brand of pillow. Corporate executives with eight-figure compensation packages said that workers needed to take ownership of their own job training to earn more. Billionaire hedge fund managers suggested that the best way to make wages climb for working people was to cut taxes for the wealthiest. If anyone was inclined to suggest that one way to address inequality might be for people with enormous amounts of money to share some with the less affluent via progressive taxation, they did not enjoy a prominent platform at Davos (or in Washington, as it turned out). This year, the Davos agenda will again explore how to broaden the benefits of capitalism, under the banner “Creating a Shared Future in a Fractured World.” Discussions will focus on the future of work, the promises and pitfalls of automation, and the potential appeal of governments extending a so-called universal basic income, in which every citizen is guaranteed sustenance. But the public-facing agenda is really just the wallpaper at Davos, a realm in which the world’s largest financial institutions throw lavish dinners for clients in hotel ballrooms, where mergers are explored in private suites, where diplomacy is pursued, lucrative relationships are forged and pop bands entertain at parties underwritten by tech titans. But for those who make it to the mountaintop, things are already pretty good. Indeed, they may be better than ever. All of which means that Davos is likely to present an especially raging party for those fortunate enough to attend this year.Those elsewhere on earth can be forgiven for wondering what all this lofty talk has to do with them.